19-20 May 2016. Nairobi, Kenya. The United Nations Environment Programme (UNEP) held its first global Science-Policy Forum in as part of the overall programme of the second session of the United Nations Environment Assembly (UNEA-2) held on 23-27 May 2016.
society stakeholders on the science and knowledge needed to support informed decision-making to deliver on the environmental dimension of the 2030 Agenda for Sustainable Development. A new resolution on Combating desertification, land degradation and drought and promoting sustainable pastoralism and rangelands was presented and adopted at the second session of the United Nations Environment Assembly (UNEA-2) held 23–27 May 2016 at the United Nations Environment Programme (UNEP), in Nairobi, Kenya. At a UNEA-2 side event on sustainable pastoralism, high-level discussions among key players in the livestock sector highlighted pastoralism’s ability to promote healthy ecosystems in the face of climate change, showing that common pastures are potential reservoirs of greenhouse gases. 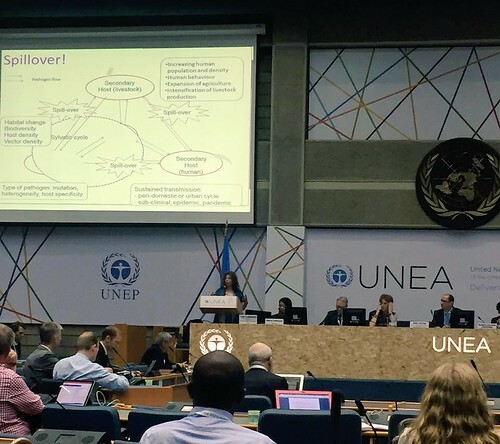 Delia Grace, a veterinary epidemiologist at the International Livestock Research Institute (ILRI), took part in the forum as a panellist for the launch of the UNEP Frontiers 2016 report on emerging issues of environmental concern. Her presentation on zoonotic and emerging infectious diseases focused on the global burden of zoonotic diseases (diseases that can be transmitted between animals and people), the drivers of disease (among them, land use change, environmental degradation and climate change) and how the multidisciplinary One Health approach can be used to support timely response to the threat of zoonotic diseases.